Have you heard about the recent grasshopper invasion plaguing the Albuquerque area? This swarm could be an indication of a bad grasshopper year so below are a couple of management tools available to organic producers. Keep in mind that the baits will not provide an instant knockdown, and neem will harm beneficials. Please remember that if you want to use one of these products and you did not include it on last year’s (2013) Organic System Plan you must email Brett bbakker@nmda.nmsu.edu or Michael Diaz mdiaz@nmda.nmsu.edu and ask to update your OSP to include use of the product you wish to use. Wait for a re= turn confirmation before you apply the product. “With 160 species of grasshoppers documented for our state, there will likely be grasshoppers—but not necessarily the ones you’re seeing now. Prominent species change over time with some more commonly seen as adults early in the growing season and some much later. I suspect the ones most folks are excited about now are Trimerotropus pallidipennis—‘pallid wing grasshoppers.’ I received some last instar nymphs earlier from a couple of places in the ABQ metro area; it’s likely those, too, are now adults—capable of flying—and doing very well at that. In fact, they are very strong fliers—capable of flying miles and miles. 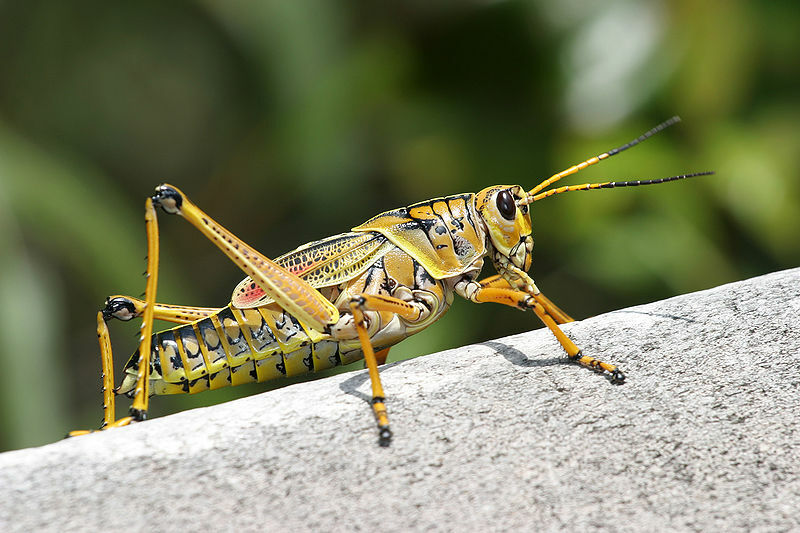 Realize that the athletic abilities of grasshoppers are very much like ours. I must walk over 50 miles—in a month—just walking the dog. I don’t walk 50 miles in just one day. I walk more miles on the weekends with shorter stints on week days. When I’m not home, she doesn’t get outta jail. Similarly, hoppers will often fly for various distances—as they are disturbed, as they finish chewing on something, as the wind switches direction, all sorts of ‘stimuli.’ What people are seeing is ‘herds’ of flying grasshoppers that are hungry and grazing as opportunities permit. That they might come out of the house in the morning—or see the side of a big commercial building—covered in dozens to hundreds of hoppers resting there—doesn’t mean the apocalypse is near. These particular hoppers seems to be attracted to security lights in the evening, so they fly in swarms to those locations and settle before it gets really dark and cold. They need to warm up in the mornings before they take off to feed somewhere. That doesn’t mean they will chew down the apple tree in the backyard before you get home, either. They will shop around, grazing like cows and horses, finding green food in locations where it is present, likely irrigated ones with acceptable fodder. They won’t be flying out onto the rangeland—it’s dry as a cob out there—nothing to eat. So, they swirl into the irrigated areas, where the good stuff is—applied ecology. As for people living on the edges of irrigated areas—or farther out—green vegetation in their yards is attractive to the flying hoppers. If they can find something better, they’ll leave those yards and hang out around the better location until it, too, is not as good as something else. As for why people get a lot of nymphs (can’t fly, just hop), they are probably near an ‘egg bed’ where female hoppers laid their eggs in the soil by last fall. Eggs don’t need a lot of moisture to complete development and hatch. But green plants need water to grow and little hoppers need green plants to survive. They head for the good green food and hang out there until there is reason to move on. Of course, the picture changes a bit for species that are permanently flightless—like the Plains lubbers. If you have those really large, colorful hoppers like the above photo—their nymphs will hatch this spring, growing up over the summer and becoming adults by late summer. Those are the ones that can hang on until Christmas or later. They never fly—at all. They can be economically important to crops, gardens and landscapes in some areas. It all depends on where they congregate. Yes, people can spray for grasshoppers but don’t count on much residual ‘activity’ after a treatment. The living keep on coming, stepping over or flying over the bodies of those there earlier. A variety of birds, lizards, small mammals and such use hoppers for food, so treatment can have adverse effects on these non-targets directly or indirectly. But you can have so many hoppers that you’ll experience plant damage. It’s hard to say how long this hopper event will last. For those with valuable plants—veggie gardens, roses, etc.—consider ‘row covers’ instead. Eventually this wave will play out. Predicting the hopper future—they also will ‘have their days’ and then adults will fade away post-reproduction; really cold winter weather will eventually kill off post-reproductive adults—and nymphs being in the wrong place at the wrong time. Chemical pesticides are not very effective against grasshoppers. They can kill off beneficial insect predators leading to a rebound of secondary pests. They can also harm beneficial critters such as birds, toads and lizards that eat grasshoppers. Read labels very carefully if you want to try baits. Timing is crucial. Small and tender plants like vegetables may need to be covered with row covers, plant fabric or screen. Most trees and shrubs will recover if they get defoliated.